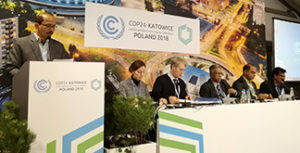 Today December 05 2018, in CoP 24 Global Climate Negotiation in Poland, Civil Society leaders from MVCs (Most Vulnerable Countries) and LDCs (Least Developed Countries) have meet a press conference in CoP-24 premises and demand for urgent action by developed countries to keep global warming to 1.5 degree temperature. They also demanded that the “Paris Rule Book” (Propose modalities to implement Paris Agreement) will contain MVCs interest addressing their vulnerability and survival strategies. 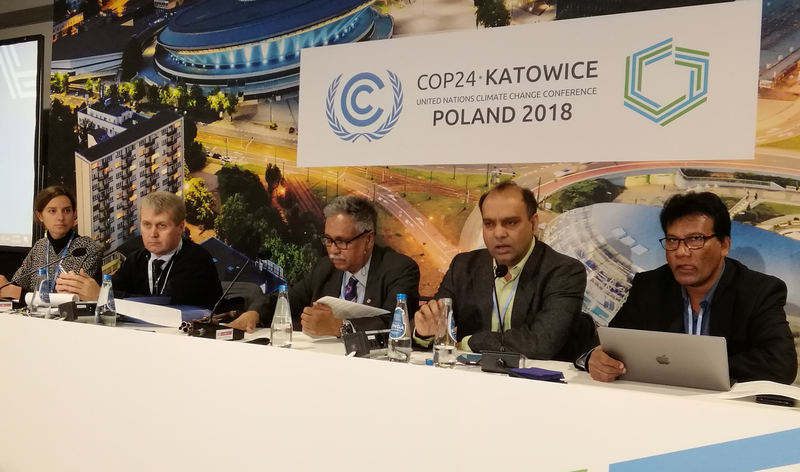 The Press conference titled “MVC & LDC’s Peoples’ expectations and CoP 24” held at the meeting room of climate conference center, Poland where representatives of different CSO leader like Dr. Ainun Nishat (Delegate of Bangladesh govt. Negotiation Team), Mr. Sanjay Vashist (Coordinator-Climate Action Network- South Asia, India), Mr. Hemantha Withanage (Executive Director-Center for Climate Justice, Sri Lanka), Mr. Atle Solberg (Head of Coordination-Platform of Disaster Displacement-PDD, Geneva) and Mrs. Lena Barenn (Coordinator-Norwegian Refugee Council-NRC, Geneva) are participated and spoke and the key demand is presented by Aminul Hoque (EquityBD) from Bangladesh. Presenting of key demand, Aminul Hoque said that due to inaction of global leaders to climate change issues, global warming already reached more than 0.85 degree Celsius which worsening the climate scenario, that’s why the IPCC latest report made it clear; the world must come together now to take serious action to stop global warming. He says that MVCs are mostly affected. The impact deprives the most vulnerable groups from basic universal rights, particularly people living in coastal areas along with women and girls. Sanjay Vashist said keeping to 1.50C, GHGs (Green Hose Gases) emissions would have to decline by about 45% between 2010 and 2030 and hit net zero in 2050. That’s significantly faster than what is needed for 20C a reduction of around 20% by 2030. We urged to developed countries to revise and enhance their NDCs as urgent action in reducing GHGs based on the IPPC 1.5 degree strategy. He also opined for ensuring long term finance for long term adaptation of MVCs. Atle Solberg express deep concern on displacement that’s happening in MVCs due to climate change impacts. Developed countries have to recognize this issue and CoP-24 is opportunity to move this issue with effective manner. TFD (Task Force on Displacement) will submit recommendations to the parties but need to start their action to avoid risk of displacement. Mr. Hemantha Withanage said that, we repeatedly remind the develop countries has an obligation to put adequate resource in to the climate financing. Report says that only 6.6 billion is available that insufficient, that’s why MVCs have to make big budget for disaster management which undermine real development for Health, Education etc. So developed countries should be accountable to appropriate finance at least climate issues and not push the ODA (Official Development Assistance) as climate finance. 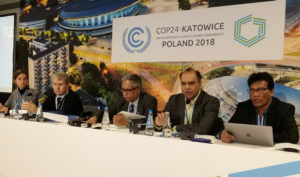 Dr Ainun Nishat said CSO will have to raise their voice, because IPCC “1.5°C” report made many messages for developed countries, but it’s core is surely that developed countries will have to take lead keeping “the global temperature to well below 2°C” while “pursuing efforts to limit the temperature increase to 1.5°C” be an inspirational one and its possible.